In the first part of this series, we talked about some of the most common reasons for no-shows and same day cancellations and we looked at three common approaches to the problem, appointment reminders, no-show fees and overbooking. Now, we’d like to talk about another alternative that can resolve many more of the reasons people don’t show. Telemedicine. Telemedicine technology connects providers and remote patients via secure high-speed audio and video connections using the computers, tablets and smartphones they already have. The solution is convenient for patients and efficient for providers. In most cases, providers are reimbursed as if the visit occurred in person and they are able to provide the same clinical services they would in the office. 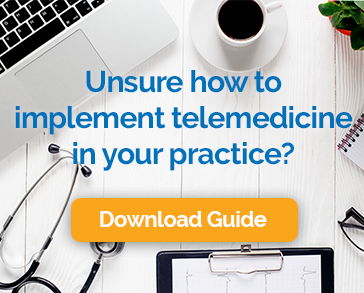 How does Telemedicine Software Address No-Shows? Let’s look at each of the common reasons that people skip appointments or cancel at the last minute and how telemedicine changes the picture. The patient forgot about the appointment: Patients are probably no more or less likely to forget a video appointment than an in-person one, but in many cases it just won’t matter. The provider can reach out to the patient at the appointed time and even if the patient forgot about the appointment, in many cases, they will be able to proceed with it anyway. Pre-visit reminders are still a good idea for remote appointments, but the risk of a negative impact to the practice is reduced. They no longer feel they need the visit: It is not uncommon for a patient to be sufficiently recovered from an ailment after an initial visit that they feel the expense and hassle of a follow-up is not worth their time. By eliminating the friction of getting into the office, the likelihood that the patient will follow through is increased. This isn’t only good for practice efficiency; it is good for patient health. Logistical factors, such as transportation or child-care issues get in the way: The option of a video visit eliminates most logistical concerns for patients. It also gives the practice the opportunity to turn a planned in-person visit into a video one if the patient calls to cancel because of a transportation, child-care or other challenge. The patient is not able to get time off work: Remote visits can be conducted from anywhere. A patient who can’t take time off of work can often take a break and find a private enough space to connect with the provider without disrupting their work day or using precious paid time off. Long wait times: Long wait times can be part of a vicious cycle. No-shows cause overbookings, which cause long wait times, which cause no-shows. Telemedicine helps to break the cycle in a couple of ways. It reduces no-shows and thus the need for overbooking, and it increases the efficiency of the practice by keeping more people out of waiting rooms. Financial concerns: Of course patients who receive care via video will still need to make their copayments and other out of pocket payments, but a video visit reduces the financial impact to the patient by eliminating missed time from work, as well as transportation, parking and child-care costs. Is telemedicine the final cure for no-shows? Of course not, but it can go a long way toward addressing the root causes and make showing up a cinch.